Magis Trash is a streamlined paper bin, designed by Jasper Morrison. 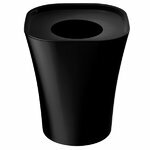 It features a lid with a hole in it and a holder that keeps the bin-liner on its place, concealed inside the paper bin. The bin's height is 36 cm and top width 30,5 cm. Due to its minimalist design Trash is the perfect choice for any space and office.